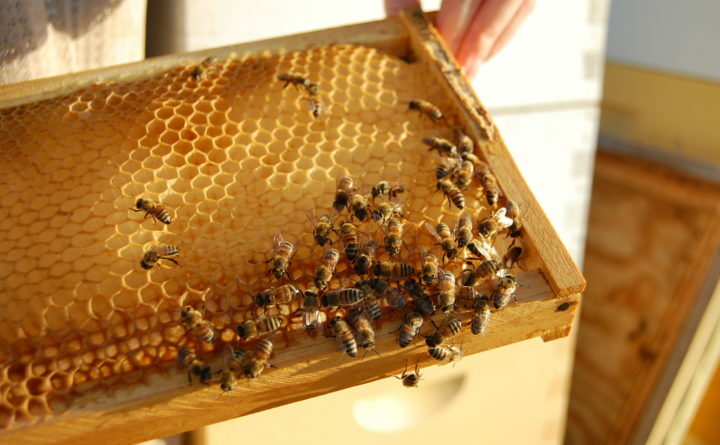 Worker bees have special wax glands that allow them to convert the sugar content of honey into wax. Author of the new book “Beehive Alchemy,” beekeeper Petra Ahnert of Milwaukee, Wisconsin, has made it her mission over the past decade to develop a wide variety of products out of what she harvests from her beehives. Honey, beeswax, pollen and propolis — all of these natural, bee-made materials have many uses, she’s found. 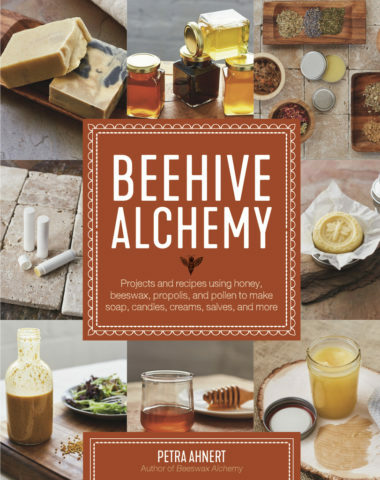 From beeswax candles to probiotic honey berry soda, Ahnert shares her favorite DIY projects and recipes using bee-made ingredients in “Beehive Alchemy,” which was released in August and features dozens of projects with step-by-step instructions, helpful diagrams and color photos. The book also includes fascinating asides on bee biology and the history of certain products. “Most of the projects I highlight in my book are relatively easy,” Ahnert said, adding that one of her favorite DIY products is beeswax lip balm. A former water resource engineer, Ahnert became wrapped up in bees by chance in the early 2000s when her boyfriend, Karl, struck up a conversation with a beekeeper’s wife at their local library. Their talk ignited an interest in Karl, which Ahnert readily encouraged. It wasn’t long before they purchased their first backyard hives. Consequently, Ahnert also developed a passion for bees, and more specifically, the many products that could be produced from their honey and wax. The only child of German immigrants, Ahnert said that both of her parents taught her the value of crafting and DIY projects. Her mother — a cook, seamstress, potter and weaver — had a mantra: “You can make that!” And her father, a machinist and engineer, was always fixing or making something, Ahnert said. The two instilled in her a confidence that she could learn to make just about anything. When it came to working with the products from her and her boyfriend’s beehives, Ahnert started by making soap and artisan honeys, which she sold at local farmers’ markets. Over the years, that product line expanded to include lip balms, lotion bars, salves and more, and she began to sell her products online. She named her business Beehive Alchemy. The book "Beehive Alchemy," written by Petra Ahnert, was published in August 2018 and includes dozens of DIY projects and recipes that showcase ingredients made by honey bees, such as beeswax and honey. In 2015, her first book, “Beeswax Alchemy,” was released. It includes instructions on how to make beeswax soap, candles, balms, creams and salves. Her second book, “Beehive Alchemy,” includes a greater variety of projects using beeswax, as well as honey, the balls of pollen that bees carry into their hives, as well as propolis, a waxy substance that bees create out of tree resins, sap and other botanical elements, mixed with bee saliva and beeswax. “Propolis is a strange and wonderful thing,” Ahnert wrote in her second book. Bees use it to seal cracks in their hive. They also use it to mummify small animals in the event that they become trapped and die in their hive, and this keeps the hive steril. Propolis is antibiotic, antiseptic, antiviral, anti-inflammatory and analgesic, making it useful in the creation of natural medicines and skin care products. “Beehive Alchemy” also has a food and drink section that includes some of Ahnert’s favorite recipes, which she’s tested and tweaked. These recipes include honey mustard, beeswax ice cream, fried honey cakes and Lithuanian honey spirits, just to name a few. Of the many recipes, Ahnert especially suggests that people try her recipe for cannele bordelais, a pastry that is dark and crunchy on the outside and almost liquid on the inside. For artistic readers, Ahnert includes information about encaustic and batnik, two forms of art that include the use of beeswax. She also devotes an entire section to the making of candles, which includes a number of helpful tips that she didn’t include in her first book. The quick cool method is a method for making pillar candles in which a fan is used to remove heat from the surface of the candle mould. This makes the candle solidify much faster than if you were to use the traditional method and simply wait for the wax to harden without the use of a fan. As a writer, Ahnert is concise and clear, without any flowery descriptions. She attributes her writing style to her past work as an engineer, and she believes that it’s well-suited for step-by-step DIY instructions. She never imagined she’d write books, but the opportunity “fell into her lap,” she said, and she’s happy that through her books she’s able to share some of what she’s learned with other beekeepers and crafty people.